I can search the photographs on my smartphone based on key words. I’ve activated automatic upload of all photos to iCloud. So, if I search on “haze,” I get all pictures that I’ve taken over the past 15 years that have a haze component. At least in our imaginations, ruins combined with haze provide interesting moods. In his essay on the subject of ruins philosopher Georg Simmel (1858-1918) decided that there’s a “peace whose mood surrounds the ruin” (383). It’s where buildings return to earth, architecture melds with stone, and the earth struggles to reach back into the sky, only to be eroded by the pneumatic forces of time and nature, an equilibrium, or a struggle, he describes as “the striving upward and the sinking downward” (383), and “the struggle between above and below” (384). Since researching such moody settings in literature and philosophy I’ve found it difficult to actually encounter such a scene: a ruin in the mist. 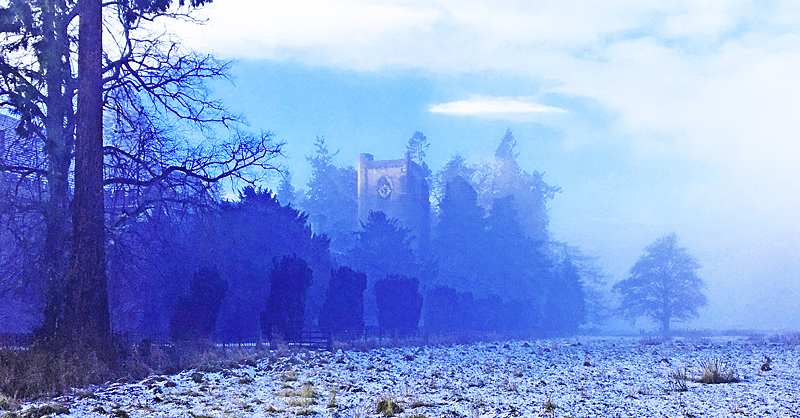 But last winter I did encounter a misty ruin undergoing restoration. 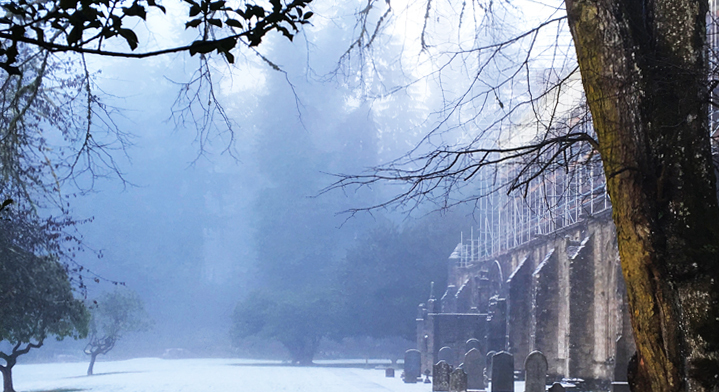 It was the small Dunkeld Cathedral, constructed within the larger ruins of a 7th century monastery. Here it is with some image adjustment. The algorithmic haze in 3D immersive computer games and simulations such as SecondLife reduces the computational cost of rendering distant objects. As well as an enhanced sense of depth, the virtual scene recedes from full colour to complete whiteout over several hundred metres. The incompleteness of ruins, the recollections they invoke of what might have been, and their frequent depictions through haze and mist also present the familiar in an alien light. Pictorial haze effects are most compelling when they involve contrast, i.e. foreground objects appear sharp and dark. Distant objects fade to white, blue or grey. Coyne, Richard. 2016. Mood and Mobility: Navigating the Emotional Spaces of Digital Social Networks. Cambridge, MA: MIT Press. Simmel, Georg. 1958. Two Essays: The handle and the ruin. The Hudson Review, (11) 3, 371-385. A search on “haze” in the online urban dictionary provides some interesting definitions, though not unrelated. Whether by natural or artificial means, self-inflicted or induced by bad agents, haze implies a clouding of judgement and the ability to discriminate. As well as occluding, haze brings certain perceptions/experiences into sharp relief. Relevant to your discussion of haze is Frances Guerin’s The Truth Is Always Grey, Minneapolis/London: 2018, which takes a fine-toothed comb to the adventures of the (quasi-) color grey in modernist painting and the industrialized landscape. Haze is a greying of an otherwise vivid chromatic scene–a scene observers cannot quite discern but intuit. Your post and Guerin’s book thesis dovetail nicely, although disparate modes of argument, examples prevail. The gradual shading from presence to absence is good both for 3D rendering engines as for imaginative projections into infinite depth. Also remarkable is how Simmel’s upward/downward metaphorics pit up-built elements against the rain of pneumatic, chemical agents of weathering (i.e., Mostafavi/Leatherbarrow’s On Weathering), which ultimately lead to a fugue of grey(s), indistinctness, amalgamation, textural and chromatic surprise. And although photographic discourse dwells on details held in the darkest, lightest tonal ranges, photographs themselves hang heavily on the neutral (grey) haze that penetrates the pictorial midway. Great comment. Thanks Daniel. I’ll check out The Truth is Always Grey. The hue, saturation, lightness (HSL) colour picker on a paint program adjusts the amount of grey in a colour, and also the grade of grey between black and white. There’s no escaping grey.